LPF600 using low-pass filter 5th order. It is applied in the Solid State HF amplifier DN-600. LPF600 allows you to filter the power to 1kW PEP. All of filters are for 50 ohm. Similar LPF used in amplifiers - ALS-600 - Ameritron, HL1.5Kfx - Tokyo Hy-Power. For switching filters applied powerful relays with a current capacity 16A. Additionally, the board LPF600 have protection circuit if excess a predefined value of SWR. This protection circuit based on transistors VT1, VT2 and relay K16. Sensitivity of the circuit you can set by resistor R8. When the level exceeds the SWR Reflected, defined by resistor R8 value, the transistor VT1 will activate the relay K16. From relay K16, for example, you can cut off voltage for the input relay RX-TX in PA. Or cut off the supply voltage of the first stage PA. Or cut off the supply voltage of the BIAS - PIN №1. Protection scheme is with the "sticky" status, ie VT1 key state is hold until you will connect ESC contact with the ground or OFF/ON the main +13,8 V voltage for the protection board. High SWR indication LED, which is connected to the contacts LED or in any other way, using the relay K16 contacts. Additionally installed comparators protection circuits against high VSWR values. The comparator U1:1-U1:2 check reflected power. The comparator U1:3-U1:4 check on forward power. Resistors of a choice of a hysteresis of installed 22k and 33k. You have choose the desired parameters of the hysteresis comparators by changing value these resistors. The VT3 transistor provides feed voltage for protection + 12V PR. In comparison with protection voltage ALARM from the K16 relay, voltage + 12V PR appears quicker. For + 12V PR there is no delay for the period of short circuit contacts (Operate Time) for the K16 relay – 4ms. In this case, on PCB, integrated several hi SWR protection circuits. Therefore your choice to apply or not the Comparators U1:1-4 and VT3. 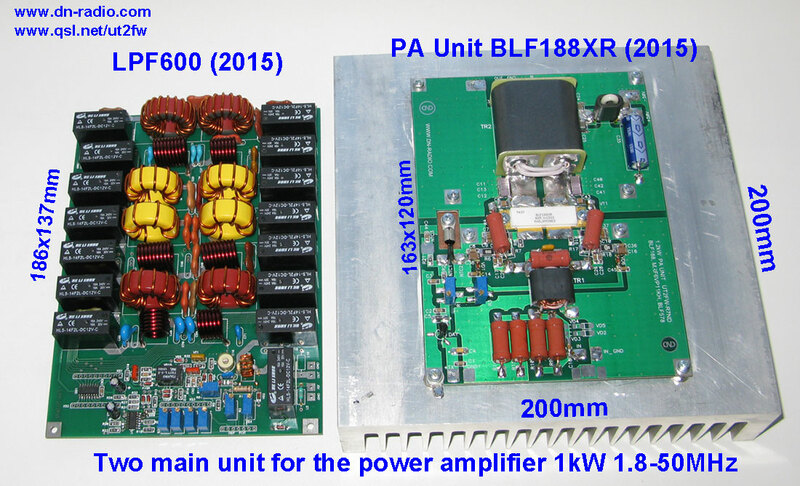 LPF600 ideally suited for amplifier EB-104, RM KL800, RM KL-500, SG-400, LDMOS transistor 1kW. More details are available on the CD in the package with the LPF600 Unit.